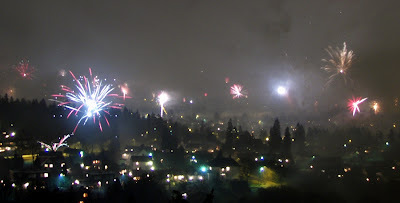 These photos are from last year's New Year's Eve. We'd like to thank you for your company and your comments this year. Hope to see you back in 2008! 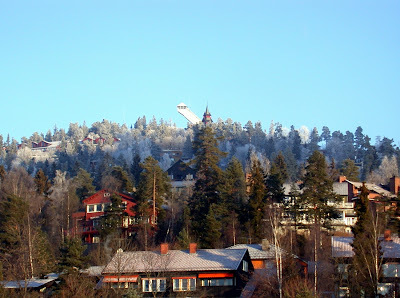 This is another photo of Holmenkollen - the ski jump. You can only see the top of it. This is an area where people with quite a bit of money like to live. 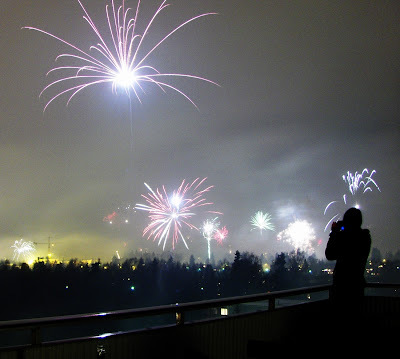 The closer you get to Holmenkollen the better. The prices are high and the houses are quite big. In this area you'll actually find houses with grass growing on the roof. (Not in this photo, though.) In the countryside in older times, this was quite normal - but not at all considered "fancy". Now, rich people sometimes choose this, perhaps to show that they appreciate the culture and history? 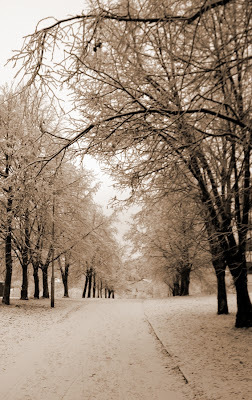 This photo is from last winter, when we actually had some snow. 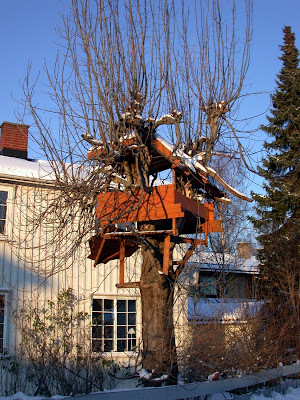 I went for a stroll and saw this nice hut that someone built in a tree. I bet they have fun playing there! We have a little snow. Enough to cover most of the ground, at least. 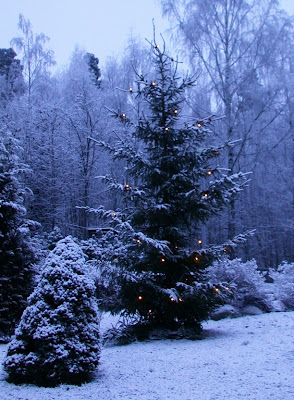 We hope you're all enjoying a peaceful christmas time. 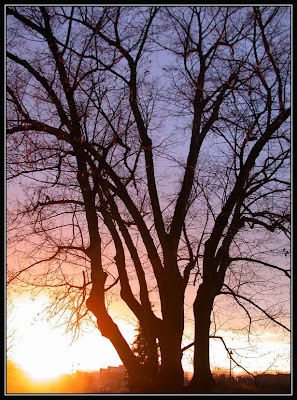 Here's a beautiful song you probably know, sung by Jussi Björling (Swedish tenor singer, 1911-1960). Warning: Goosebumps and tears may appear. 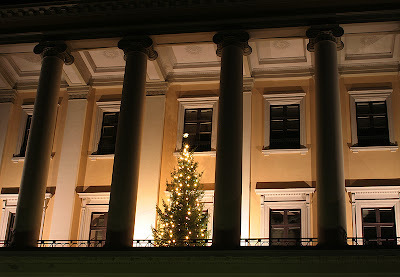 Oslo Daily Photo wishes you a happy christmas! Here's a fun christmas song for you. This is The Travelling Strawberries' Støveldance. 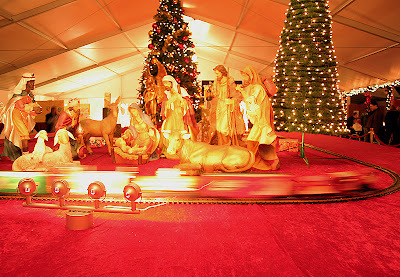 It's from a TV-series that was shown before christmas some years ago. Crazy humour and the songs were a mix of English and Norwegian. My guess is that you'll figure out the lyrics pretty well, even without knowing Norwegian. Enjoy! The time right before it gets dark, seem almost blue and is often called 'the blue hour'. Poor Kristie. 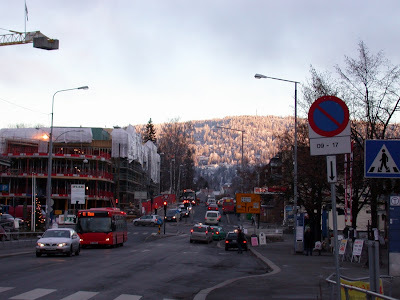 Moving from California to Norway, she's delighted about winter and wakes up everyday hoping it has snowed. So far, nothing. Every other day she's posting about the lack of snow and it's painful to see her disappointment. Therefore, I had to tell her the truth. 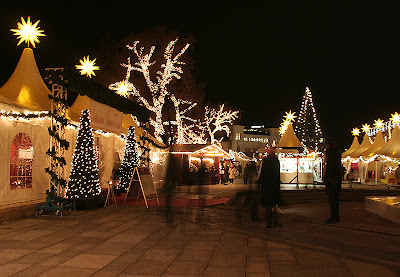 More photos from the Christmas market. 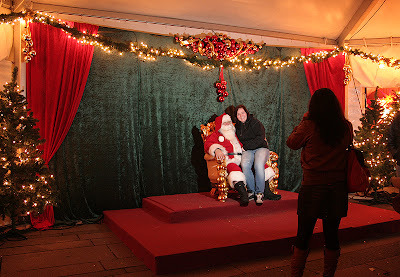 Santa was there too, as you can see. I wonder how much electricity they use to keep all these lights going? Christmas is obviously not the time of the year when the environmental issues are considered. 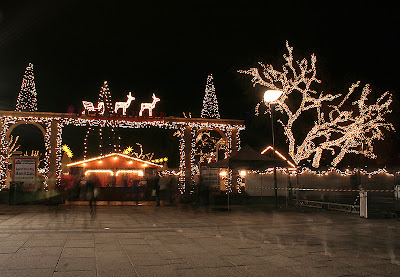 These are photos from Stormel's visit at the Christmas market (the Christmas village) which is in front of the Oslo City Hall. 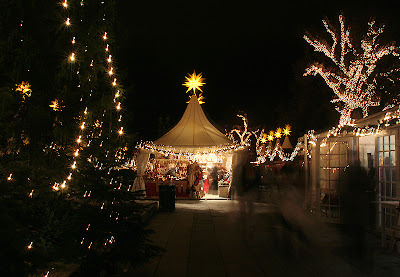 Lots of lights, a small fun fair, booths where you can buy candy, Norwegian arts & crafts etc. According to Stormel: A mix of American* and Norwegian Christmas - a little something for everyone. 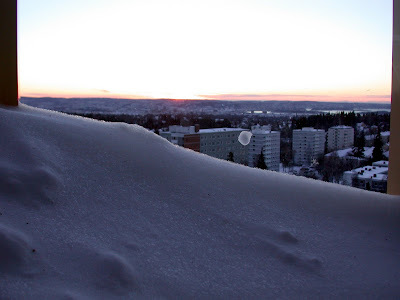 These past days it's been really cold in Oslo. 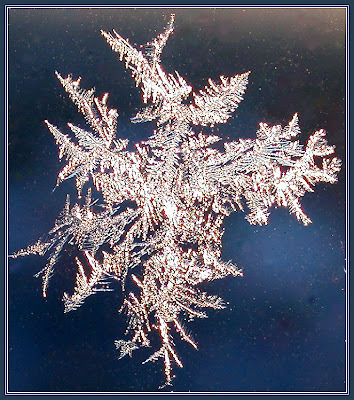 The temperatures have been as low as - 10 C/14F. 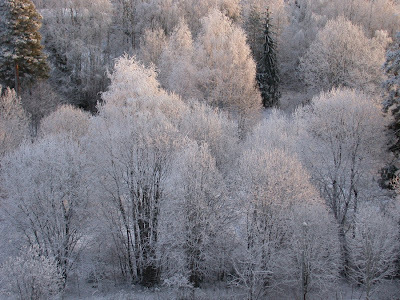 No snow yet, but because of the cold; the frost is covering the trees and the ground. 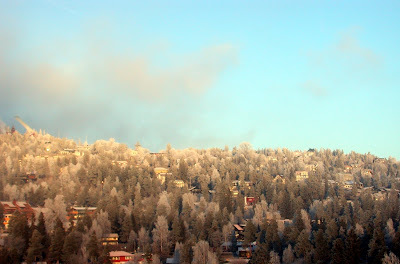 The morning I took this photo, it was foggy at first - but then the sun shone through and I could see the ski jump "Holmenkollen" at the top of the hillside nearby. This is a closer look at the royal castle balcony. I really love the details of the ceiling. Another photo from the royal castle. They seem to have a nice christmas tree on their balcony. That's the same spot where the royal family greets the children passing them in the parade on May 17th. 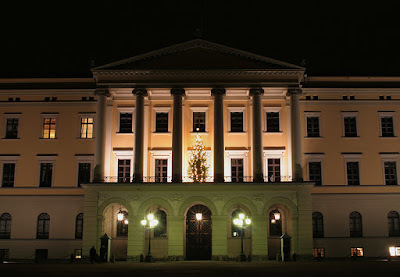 This is a recent photo of the Roycal Castle in Oslo, quite beautifully lit in the dark winter evening. The photographer is André and I'm asked to write that he's 34 years old, single and has a glimt in his eye. ;-) Thank you, André! 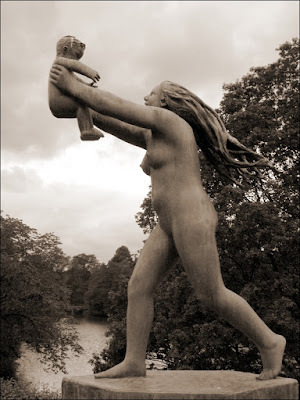 This is a statue in The Vigeland Park (or Frognerparken as we often call it). This park is one of Oslo's main sights; always lots of tourists. 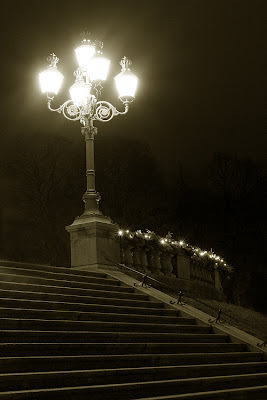 But the citizens of Oslo use the park too, it's one of my favourites places during all seasons. More information about Vigeland Sculpture Park. 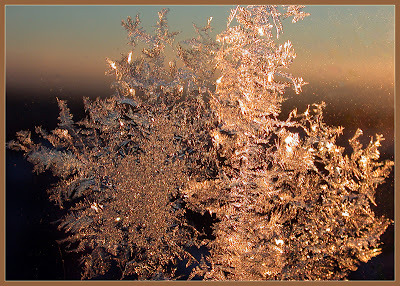 NB: Thanks to Kristie, I've nominated this photoblog at the Photoblog Awards. 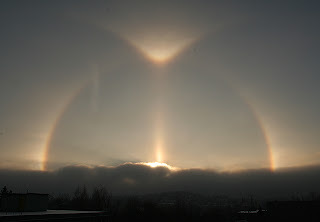 If you like to vote for Oslo Daily Photo, please visit this link. NB2: Please sign the emergency petition at avaaz.org: Stop the Climate-Wrecking at Bali. This beautiful light is in front of The Royal Castle. 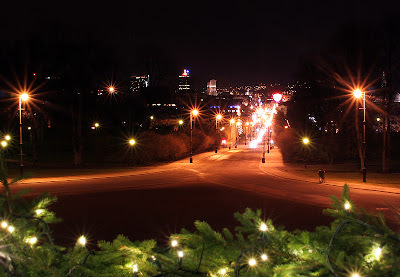 Karl Johan street, by night, seen from The Royal Castle. This is a statue of King Haakon VII of Norway. He was really a prince of Denmark; Prince Carl, but elected by the Norwegian people as their king, after the dissolution of the union with Sweden in 1905. He and his wife, Maud - princess of Great Britain and Ireland, came to Norway with their son Olav (at that time Alexander) on November 25th 1905. 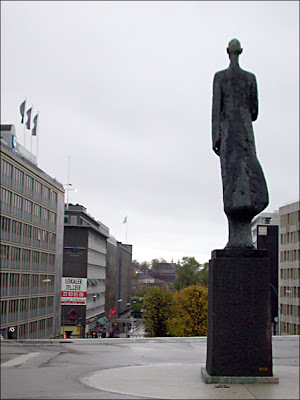 King Haakon was very loved by the people, especially after World War II, as he refused to surrender to Germany. Prince Olav became king after his father's death in 1957 and became just as popular as his father, if not even more. 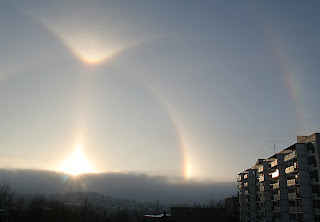 This is taken in Oslo a couple of years ago, in December, probably around Christmas Eve. And it's taken right outside the house I grew up in. 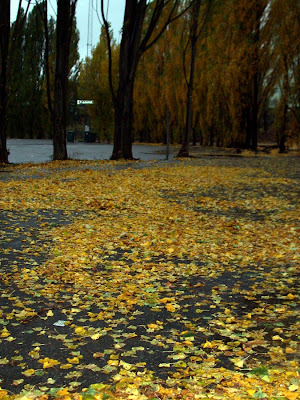 This is another photo from behind the Nobel Peace Center. This yellow building is a extension on the brick building I showed you in yesterday's post. Earlier these buildings were part of the railway station that used to be here. 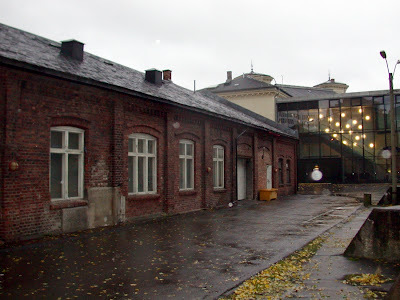 At the time I took this photo, the two open doors you can see, leads you into exhibition rooms used by artists. 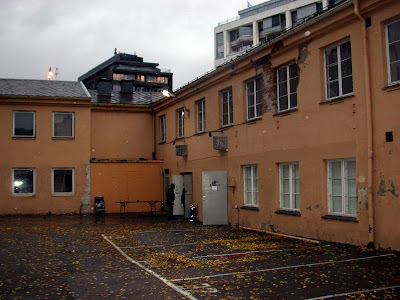 Behind the Nobel Peace Center... you'll find this old brick building. The rain did wash away the snow. Oh well, I guess I'll just have to show you some more of my autumn photos while I wait for more snow. This was taken about a month ago. 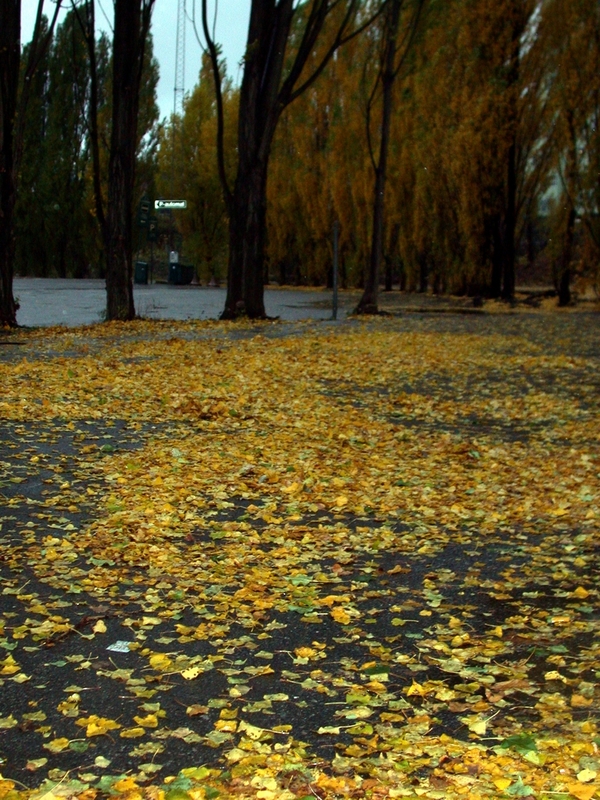 As you can see, there was so much autumn leaves that it almost covered the ground like a carpet.